Prof. Jordan S. Penkower notes the places in which “final nuns” could be found in the oldest complete Torah scroll. Hallie Kay/Mitzpeh. 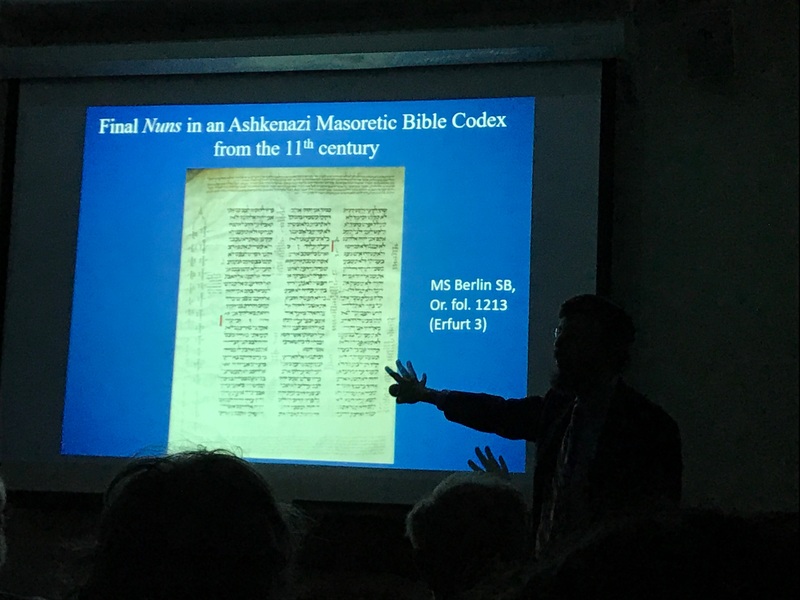 An acclaimed professor and expert on the transmission of the Hebrew Bible, Jordan S. Penkower, came to College Park Tuesday to discuss the one-of-a-kind intricacies of the oldest complete Torah scroll. Penkower, a published author who has done extensive work on the intricacies of the Bible, has authored several works, including “New Evidence for the Pentateuch Text in the Aleppo Codex,” published in 1992, and “Masorah and Text Criticism in the Early Modern Mediterranean: Moshe ibn Zabara and Menahem de Lonzano,” published in 2014. The lecture was hosted by the Joseph and Rebecca Meyerhoff Center for Jewish Studies at this university, and was part of a series of lectures that Penkower has given at several universities around the country. “He is one of the most distinguished scholars of the biblical canonical tradition,” said Bernard Cooperman, the Louis L. Kaplan professor of Jewish history at this university. The Torah scroll that Penkower discussed, which happens to be the oldest complete Torah scroll in the world, is preserved in the library of the Alma Mater Studiorum at the University of Bologna. “When you study old Torah scrolls, expect the unexpected,” Penkower said. The scroll itself can be dated back to around the 12th or 13th century and has origins in the Eastern parts of the ancient world. Penkower found this through the more Eastern style of the way the Hebrew letters were written. Penkower presented his findings, which included theories on the reasons that certain aspects were added, erased and preserved in this Torah scroll, and what it says about Jewish religious history as a whole. The lecture comprised of Penkower’s findings on the presence of the “final nun” being a Hebrew letter, what it means in each context, the occurrence of mistakes in Torah scrolls and the different styles of Biblical notation. Penkower also explored the presence of tagim, or crowned features that accompany many Hebrew letters in various Torah scrolls. In addition to this, he pointed out the use of majuscule and miniscule letters, saying that the size of the letters also indicated certain meanings. The “final nun” in many cases, Penkower said, signifies the beginning of the weekly reading of the Torah. “This is like looking for Waldo,” Penkower joked about trying to find hidden “final nuns” in certain parts of the Torah scroll. The “final nun” also signifies the keeping of old tradition, like in Spain during the Spanish Inquisition when the study of Torah was forbidden. “When you know what you’re looking for, you sometimes overlook it,” Penkower said. He added that until the “final nun” was noticed, no one really knew it was recurring. “Qerei-Ketiv” refers to the differences found throughout the Torah that indicate a line is pronounced or read differently than how it is written. “You would have to have an oral tradition” to know to do this, Penkower said. Many instructions like this were not typically written down. Penkower compared this to the idea that many Torah scrolls before the 7th and 8th centuries did not have vowels to indicate pronunciation. There were 61 cases of the “final nun” found in what Penkower referred to as “Torah Scroll 2,” the oldest complete scroll from the University of Bologna that Penkower was lecturing about. He discussed the variations of corrections made in Torah scrolls, ranging from omission of words and sentences to writing a letter twice, or even an entire sentence wrong. Scribes of the medieval world, Penkower said, were quite clever in their correcting techniques. Many scribes would erase letters and connect others together to create one letter, and would cramp in another letter if they missed it. The reason for this meticulous work, Penkower said, was the fact that making a Torah scroll was quite expensive and difficult to do. He noted that even the greatest of scribes made mistakes. Arsema Negash, a freshman Letters and Sciences student, attended the event to listen to Penkower’s take on this scroll. No Replies to "Professor discusses intricacies, patterns of oldest complete Torah scroll"